Microsoft apparently had a very good idea as to the direction they wanted to travel in 2010, in regards to their Xbox division at least. A business presentation originally written in 2010, and leaked to the document upload service Scribd in 2012, seems to have laid out a very clear and concise path that they wanted to follow with their Xbox game console. That vision is the same vision that we’ve now seen as coming to fruition for the Xbox One, as a full entertainment room solution. 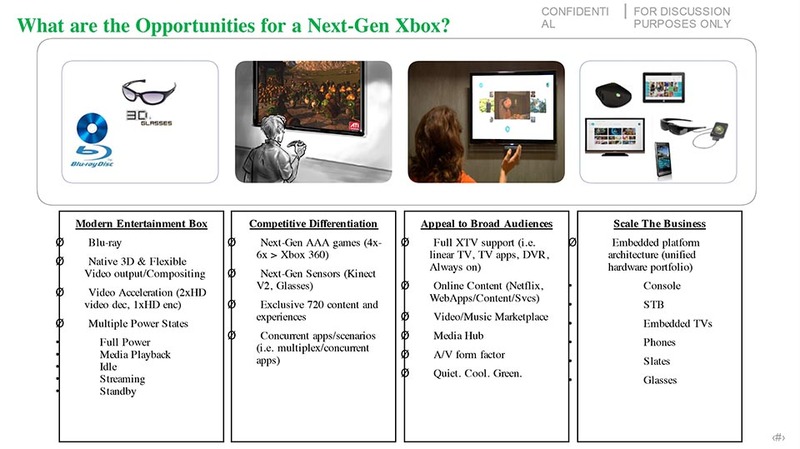 The document seems to center around the current gen console, then called the “Xbox 720” actually. They list all of the media integration ideas that have almost been fully implemented. They intended to produce a console that could stream a variety of types of media from the apps that we all know and love like Netflix and Hulu, as well as even network specific apps. Listed are the abilities to pass through TV and record media to the DVR as well as even a game streaming ability, like the one that should be implemented when Windows 10 is released. They do list it as being a “green” device, which power tests seem to disagree with, depending on your definition of “green”. 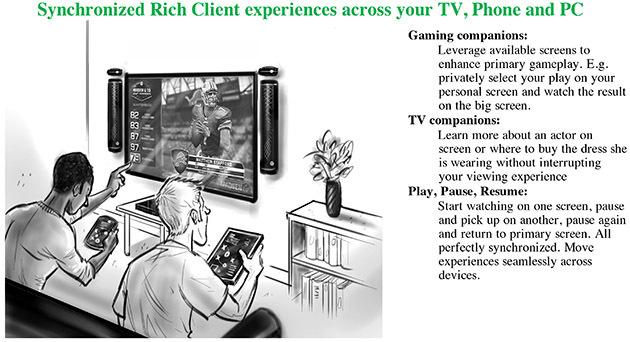 While the document clearly focuses on the Xbox One and the Kinect V2, there are also other products mentioned in the document. Firstly, they mention the impending release of a lower cost Xbox 360, dubbed the “Xbox 361” and they even mention the HoloLens in its earliest stages of inception. It’s very interesting because they call it “Kinect Glasses” at one point, alluding to the direction they may have wanted to take with it on the Xbox platform. Just imagine using the HoloLens for games, as a sort of second screen you can interact with with the assistance of the Kinect 2.0. Elements of the game can be either off screen completely or overlays while looking on the screen. Or really anything. Regardless, they wanted to, and likely still want to, make it a part of a complete immersion experience. The possibilities are really endless. 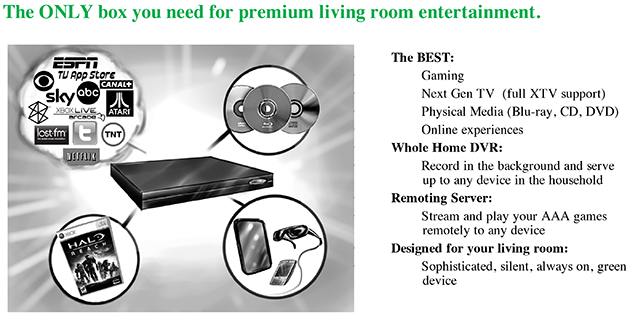 A true wireless option that has the ability to stream games to it is also mentioned. Interesting! They already had a good idea with how they wanted to progress, even if that is counter to what many of us would wish. This shows that the Xbox division already has strong leadership outside of the change to Microsoft proper and indeed had a plethora of innovative (though we do not always agree on this point) ideas that can drive the industry to new areas. HoloLens is a new take on the VR landscape, providing a different and more augmented reality that can be integrated into our everyday lives. It’s very comforting, I suppose, that they were so focused back then on their goals. We may not all agree on their direction, but at least they have one. And they now listen to the community a bit more too, supposedly.